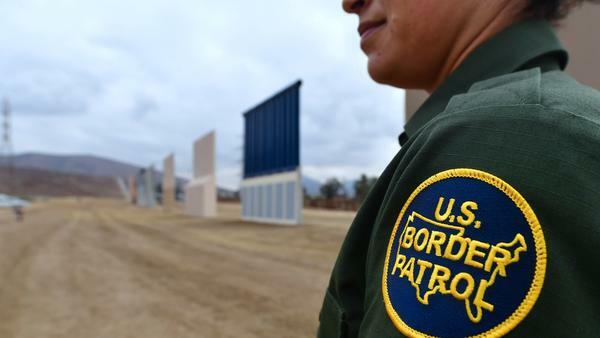 A U.S. Border Patrol officer stands near prototypes of President Trump's proposed border wall in San Diego last November. A senior White House official frames the outline as a "bipartisan compromise position," but Democratic lawmakers have repeatedly rejected including changes to the legal immigration system as part of any DACA fix, even as they've offered to increase funding for border security. And for some Democrats the window of bipartisan outreach seems to have closed. "The White House is using Dreamers to mask their underlying xenophobic, isolationist, and un-American policies, which will harm millions of immigrants living in the United States and millions of others who want to legally immigrate and contribute to our country," Rep. Michelle Lujan Grisham, D-N.M., the chair of the Congressional Hispanic Caucus, said in a statement in reaction to the White House framework. And a Democratic lawmaker who has been a forceful advocate for the cause of those enrolled in DACA suggested that meeting the White House's demands would come at too high a price. "$25 billion as ransom for Dreamers with cuts to legal immigration and increases to deportations doesn't pass the laugh test," tweeted Rep. Luis Gutierrez, D-Ill.
House Minority Leader Nancy Pelosi, D-Calif., tweeted that the proposals are part of "an unmistakeable campaign to make America white again." Senate Majority Leader Mitch McConnell, R-Ky., who has promised to hold Senate floor debate on an immigration measure in the coming weeks, offered praise for the outline but made it clear Congress will still craft the actual language of a bill. "I am hopeful that as discussions continue in the Senate on the subject of immigration, members on both sides of the aisle will look to this framework for guidance as they work towards an agreement," McConnell said in a statement.